All-round white water cagoule with a female specific 4D cut for added comfort. The Palm Zenith women's cagoule has a female specific 4D cut which offers a better range of movement and comfort for the female paddler. The Palm Zenith has a mid-weight construction and uses XP 2.5 layer waterproof and breathable fabric to keep to you cool and dry. 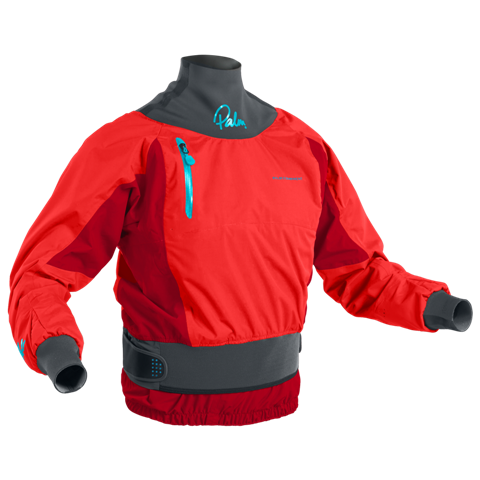 The Zenith is a great all-round paddling cagoule for surfing, playboating and runs of your favourite river. We offer a delivery service for the Palm Zenith Womens throughout the UK & Ireland to home and work addresses. We will endeavour to despatch all orders for delivery on the next working day. Orders placed on a Friday will be dispatched the following week. Buy a Palm Zenith Womens online from our website and collect from our shop at Lee Mill, Plymouth, Devon or you can collect from any branch within the Canoe Shops Group. There is no cost associated with this.